Passionforfashion’s new Lucky Pulpit colt, who has not yet been named. 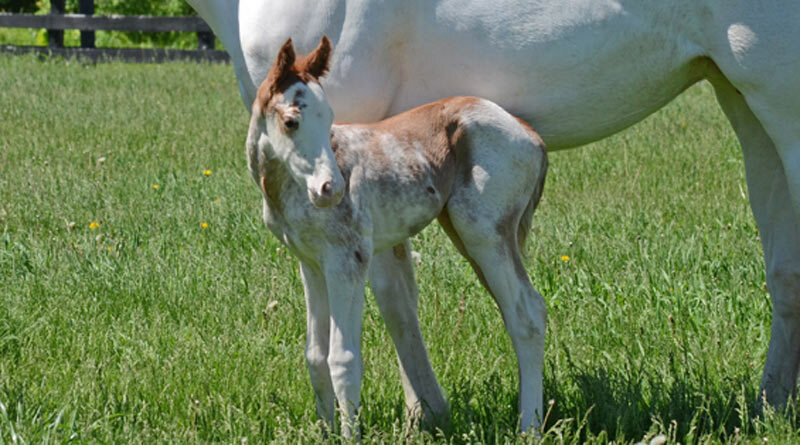 Kentucky Derby winner California Chrome has a brand new half brother with way, way more chrome than he does. A striking patchy-marked chestnut and white colt born on May 19 at Stone Bridge Farm in New York is from the last crop of California Chrome’s sire, Lucky Pulpit, who died three months ago after covering his first mare of the 2017 season. He was only 16. The colt was delivered by the white mare, Passionforfashion, who owner/breeder Gary Tolchin acquired privately last year after a long search for a white thoroughbred. Turf Club, the dam of Passionforfashion. “I always wanted a white horse after I saw one at Aqueduct with my father, Sam Tolchin, when I was growing up. My goal is to continue breeding white horses,” Tolchin said, adding that he intends to keep the newborn colt and eventually place him in training for racing. Passionforfashion is pure white but her dam, the Trust N Luck mare Turf Club, also had liberal chestnut markings like the new arrival. After an unsuccessful attempt to buy another white mare at auction, Tolchin found Passionforfashion through social media. She was located by one of his agents, bloodstock and media consultant Michele MacDonald, in a Facebook posting by trainer Doug O’Neill’s operations manager, Sharla Rae Sanders, and soon purchased from previous owners. Passionforfashion and her Lucky Pulpit colt. Since Passionforfashion, a daughter of Unbridled’s Song’s multiple graded stakes-winning son Old Fashioned, was located in California and the 2016 breeding season was coming to a close, MacDonald recommended she be bred to Lucky Pulpit, who stood at Harris Farms. The cross of the Pulpit and Unbridled lines is the same general cross that produced leading sire Tapit. Tolchin arranged the mating with Lucky Pulpit, California’s leading sire in 2016 and sire of record-setting, two-time Horse of the Year California Chrome. After Passionforfashion was safely in foal, he shipped her to Stone Bridge Farm. “We think he’s great,” Stone Bridge Farm manager Heidi Fischer said of the colt, who has a sturdy frame and good bone. Thoroughbreds with markings similar to the colt’s color pattern are rare, but several have become sensations while racing in Japan. The white Sunday Silence mare Shirayukihime produced multiple stakes winner Yukichan, a white filly by Kurofune, and fan favorites Marble Cake and Buchiko, both chestnut-spotted, registered white fillies by King Kamehameha who became popular multiple winners for owner/breeder Makoto Kaneko. “I was fascinated when I saw the white horse with my father, and I’ve always liked them and gray horses, which seem to be lucky,” said Tolchin. “This all fell into place when Michele saw Passionforfashion on Facebook, and I said ‘let’s do it’ with the mating to Lucky Pulpit. I want to thank the people at Harris Farms, who were so helpful, and Stone Bridge Farm, which does such a great job. Turf Club with her dam, Deebrand. Tolchin, who is based in New Jersey and is active in the New York and Kentucky breeding programs, has owned or co-owned many prominent runners, including champion Big Brown, winner of the Kentucky Derby and Preakness Stakes.